Esther's Design Blog: WOW: What A Mess! There's actually quite a few things I'd like to do today, but I can't find any of it - there's fabric, patterns, freezer paper, fusible and general mess in the way. So that's my task - tidy up and put everything away.. just so I can create a whole new storm of creative mess for a different project. Sigh. I need a bigger sewing room! I do think a lot of us have a similar mess going on. Good luck with the tidying up. I hope you don't get sidetracked. 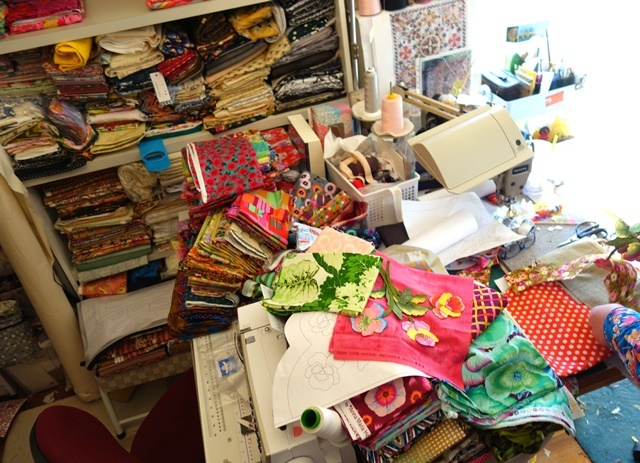 I have a similar mess and the idea of dealing with it keeps me out of my sewing area a lot more than it should. Oh, no. Esther -- if you had a bigger sewing room, you'd just end up with an even bigger mess that would take longer to dig out of! People with giant sewing rooms end up buying 2 or 3 of every tool and notion because they give up looking for it and just buy a replacement!